This is a good microcosm of exactly what happened Saturday in Charlottesville. Unite the Right event organizer Jason Kessler attempted to hold a press conference on Sunday to address yesterday's insane rally. 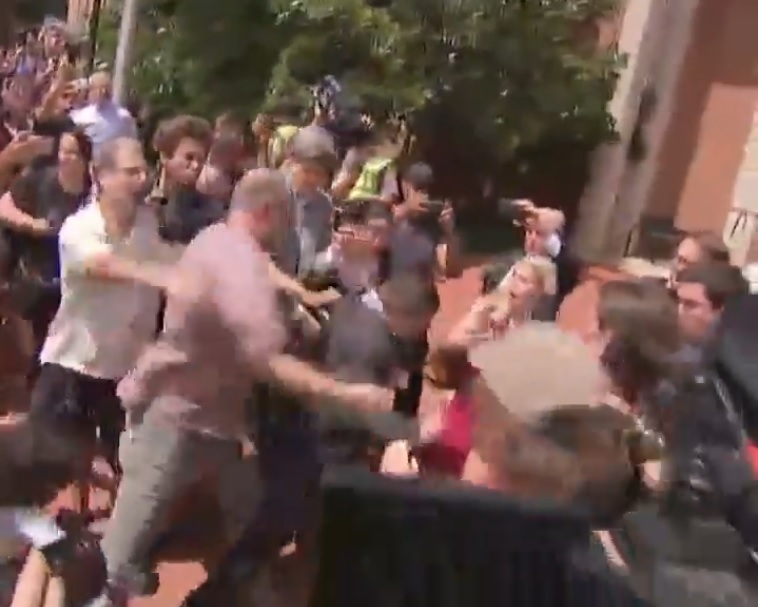 Predictably, a leftist mob came to shut the press conference down. Police, once again, did nothing to maintain the peace and let the mob attack him. After the violence broke out and the press conference was shut down, then the police finally stepped in. Jason Kessler assaulted by antifa as he tries to exit his Press Conference. "On the day of the event Charlottesville Police not only refused to carry out public safety arrangements discussed for months in advance, they disbanded a peaceful assembly being attacked by Heckler's Veto and pushed a crowd of right-wingers into a crowd of Antifa, leading to chaos and violence," he said. Multiple videos back this up, as well as the ACLU. The alt-right rally-goers were told to march straight through a violent mob of leftists in order to get to Lee Park and got pelted with bags of excrement and urine and were sprayed with bear mace. This is simply a fact. As President Trump said, there was violence on both sides. A female reporter for The Hill was attacked after filming the crash. Similar rallies have happened before and police kept the two crowds apart to prevent violence. The Charlottesville mayor and police appear to have been given a stand down order so the permitted rally -- which a federal judge ordered to be allowed after lawsuits were filed by the ACLU and the Rutherford Institute -- would escalate to violence and be shut down immediately. Antifa and Black Lives Matter -- who did not have a permit -- were then allowed to March unimpeded.